Sanguisorba menziesii is instantly eye catching. It bears dense floral clusters of deep red, caterpillar shaped flowers on upright wiry stems 60 to 75cm (24 to 30in) tall. The attractive blue-green rounded leaves are pinnately arranged on gently arching stems. Sometimes referred to as the Alaskan Burnet, these plants prefer moist, but not waterlogged soil but will thrive in an open sunny border or in part-shade and are very hardy, as the common name might suggest. 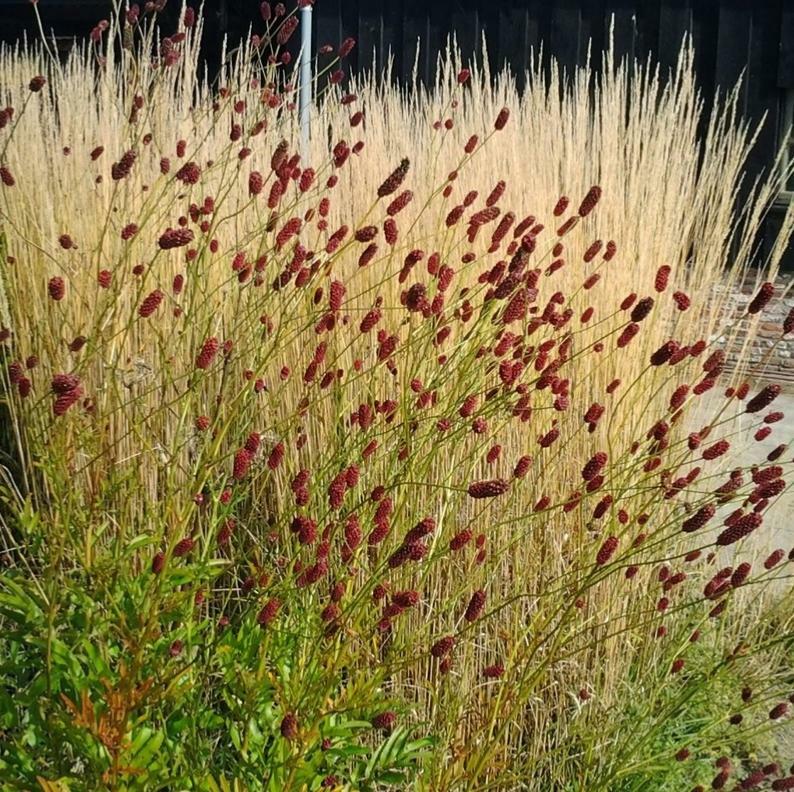 Sanguisorba menziesii is often the first sanguisorba to flower, appearing in May, they are in full flower throughout early summer.They retain the deep red colour for many weeks and the seed heads keep their shape and colour, increasing the interest longer into the season. A great plant also for cutting. Plants prefer a moist site. Clumps may be easily divided in early spring. Cut foliage back if it gets tired-looking after flowering. 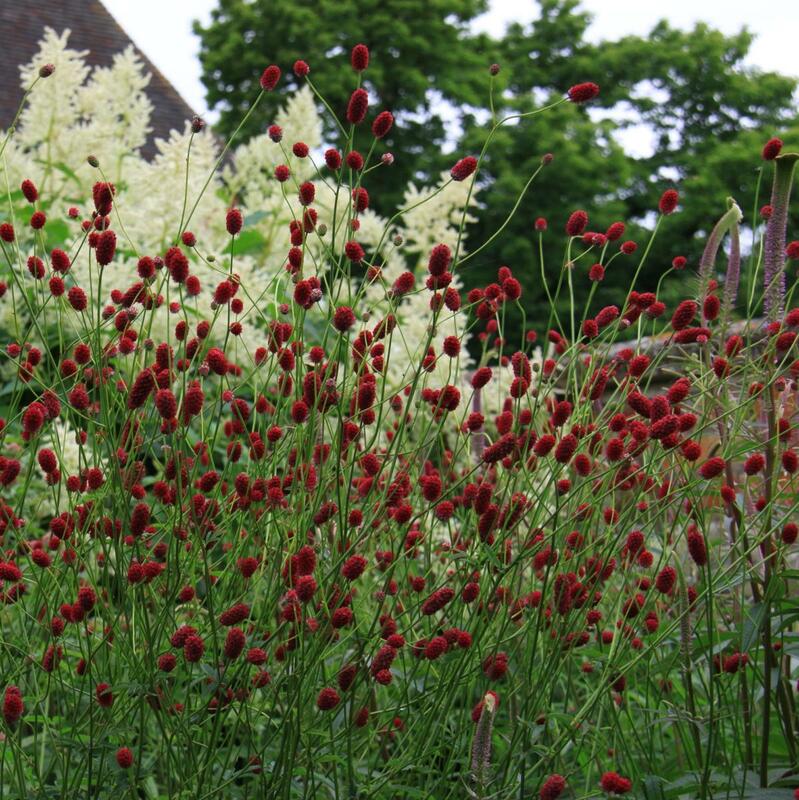 Sanguisorbas are currently very fashionable, and deservedly so, for they provide flowing movement and have an elegant natural presence, which is a good fit for the modern naturalistic planting style made popular by Piet Oudolf and others. They have finely toothed pinnate foliage, above which the long-lasting flowers hold themselves high on wiry stems. They associate brilliantly with equally tall, airy ornamental grasses, flat headed daisies and the spiky and whorled verticals for instance of Phlomis, Nepeta and Veronicastrum. Sanguisorbas can be left to fade decadently into winter before being cut down in spring. Suspended on swaying stems, the intricate forms catch the frost brilliantly, giving six months of garden interest.